Developed by Dr. Lincoln Taylor at Virginia Tech, Mohawk is one of the coldest tolerant Bermuda varieties available. It is high yielding and can be used for both grazing and hay production. 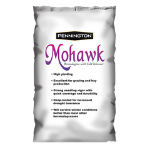 When compared to other popular seeded Bermudas, Mohawk is a proven top performer. With superior cold tolerance, it is well adapted from the southern areas of California, Oklahoma and Missouri, east to Virginia.